54 Glasthule Road, Sandycove, Co. <?xml:namespace prefix = st1 ns = "urn:schemas-microsoft-com:office:smarttags" />Dublin. The business started with ladies supping port in its Grafton Street tearoom. Nearly 200 years later wine and spirits merchants Mitchell and Son is still owned by the same family. This Dublin wine shop offers a huge variety of services and one of the most popular is the online shop. This digital retail outlet provides as much information as possible on each item displayed. Mitchell & Son provide an excellent shopping service online. Shoppers can purchase a selection of 2,3,6 and 12 bottle gift boxes and there's also some food and wine pairings available. 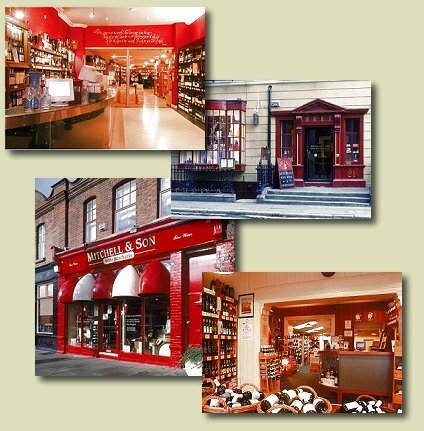 Mitchell & Son provide a range of services at their store in Kildare Street. Customers can make use of the Glass Hiring service where a range of wine and champagne glasses and tumblers are on offer. Wine courses and wine trips can be enjoyed by contacting Mitchell & Son. This reputable Dublin Company also provides Gift vouchers and a Gift service that offers a delivery service to customers in Ireland. For up market wines and excellent service visit Mitchell & Son on Kildare Street in Dublin or log onto to Mitchell & Son website to shop online.